A promotional USB can be a breathe of fresh air in terms of promotional gifts. Instead of notepads or pens, why not offer a customised USB for your clients? The number of designs and possibilities are limitless, and here we have a fantastic example of how they can be used to good effect. This particular USB drive has been designed in the shape of a wine cork. This is an ideal item to promote wine or other luxury goods. Below we will state why this type of design could help your business. Design: In this example, the USB has been made out of cork, a light and durable material. Additionally, because of its compact size, customers will find it easy to travel with on-the-go. Moreover, a USB has a high desirability factor, as it is an item that is likely to be used by many people. Whether it be files or photos, USB’s are constantly used for business or personal use. With something such as a wine cork USB, you can be sure that you are providing the customer with an item that they can get significant use out of. Brand Awareness: All of our promotional USB’s can be printed with your logo or company name. Because a USB can be used at home, school or at work, it can be exposed to a large audience. You can therefore be sure that your brand is getting out there and noticed by others. 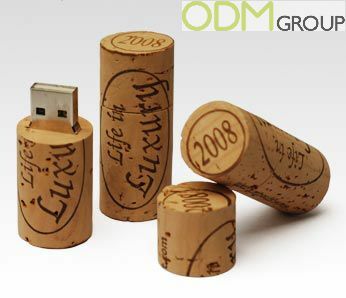 The wine cork USB is a great example of clear and defined branding, which will be sure to increase brand awareness. 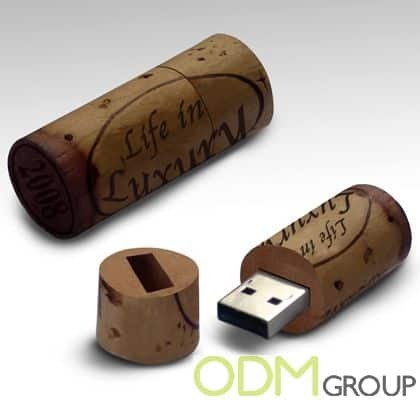 Stimulate Sales: A wine cork USB could be offered to potential customers as a gift with purchase or on pack promotion for example. Everyone enjoys a free promotional item, and providing such a useful item free of charge will encourage customers to come back to your brand and purchase more of your products. This in turn, will directly increase the revenues that you receive. Improving Brand Image: By providing such as high quality gift such as a wine cork USB, peoples outlook on the quality of your brand will improve. They are therefore going to place more faith in your products and services, improving your brand image. This in turn is likely to bring in further purchases for your business. We have therefore established that using a promotional USB can be extremely effective in helping a business expand. Get your brand out there and seen today with a promotional USB! Here at ODM, we have significant experience in product design, product sourcing and product manufacturing. We can help you utilise your 2016 marketing budget in an effective manner. Be sure to check out our ever-expanding gift with purchase portal in order to find out some more similar case studies. Be sure to use the code “ODM – 960″ when asking for a quote for a fast pricing.